In the "mood" for a fun giveaway? The 17 oz. 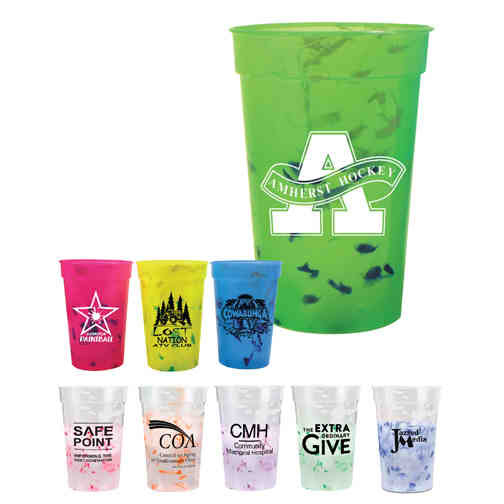 Confetti Mood Stadium Cup is available in assorted colors and changes color with ice cold liquids. Ideal for outdoor events, this USA-made item can be featured at company picnics, parties, tailgates, festivals or competitive events. You get plenty of space to add a personal message or your company name or logo through the silkscreen option. Warning: Severe weather conditions may effect the mood change. Size: 5 " x 3.4375 "
Imprint Size:3-7/8" W x 3" H per side. Note: Due to the nature of the product, the "confetti" pattern on each cup is different. We recommend bold type and graphics in all ad copy. Fine lines, fine type, and intricate logos may not be easily read. Multi Color Imprint; one side only. Second column quantity break minimum for multiple color imprints.